Deposits of sand and gravel, the unconsolidated granular materials resulting from the natural disintegration of rock or stone, are generally found in near-surface alluvial deposits and in subterranean and subaqueous beds. Sand and gravel are siliceous and calcareous products of the weathering of rocks and unconsolidated or poorly consolidated materials. Such deposits are common throughout the country. Sand and gravel typically are mined in a moist or wet condition by open pit excavation or by dredging. Open pit excavation is carried out with power shovels, draglines, front end loaders, and bucket wheel excavators. In rare situations, light charge blasting is done to loosen the deposit. Mining by dredging involves mounting the equipment on boats or barges and removing the sand and gravel from the bottom of the body of water by suction or bucket-type dredges. After mining, the materials are transported to the processing plant by suction pump, earth mover, barge, truck, belt conveyors, or other means. Although significant amounts of sand and gravel are used for fill, bedding, subbase, and basecourse without processing, most domestic sand and gravel are processed prior to use. The processing of sand and gravel for a specific market involves the use of different combinations of washers, screens, and classifiers to segregate particle sizes; crushers to reduce oversized material; and storage and loading facilities. After being transported to the processing plant, the wet sand and gravel raw feed is stockpiled or emptied directly into a hopper, which typically is covered with a "grizzly" of parallel bars to screen out large cobbles and boulders. From the hopper, the material is transported to fixed or vibrating scalping screens by gravity, belt conveyors, hydraulic pump, or bucket elevators. The scalping screens separate the oversize material from the smaller, marketable sizes. Oversize material may be used for erosion control, reclamation, or other uses, or it may be directed to a crusher for size reduction, to produce crushed aggregate, or to produce manufactured sands. Crushing generally is carried out in one or two stages, although three-stage crushing may also be performed. Following crushing, the material is returned to the screening operation for sizing. screens. Rotating trommel screens with water sprays are also used to process and wash wet sand and gravel. Screening separates the sand and gravel into different size ranges. Water is sprayed onto the material throughout the screening process. After screening, the sized gravel is transported to stockpiles, storage bins, or, in some cases, to crushers by belt conveyors, bucket elevators, or screw conveyors. The sand is freed from clay and organic impurities by log washers or rotary scrubbers. After scrubbing, the sand typically is sized by water classification. Wet and dry screening is rarely used to size the sand. After classification, the sand is dewatered using screws, separatory cones, or hydroseparators. Material may also be rodmilled to produce smaller sized fractions, although this practice is not common in the industry. After processing, the sand is transported to storage bins or stockpiles by belt conveyors, bucket elevators, or screw conveyors. 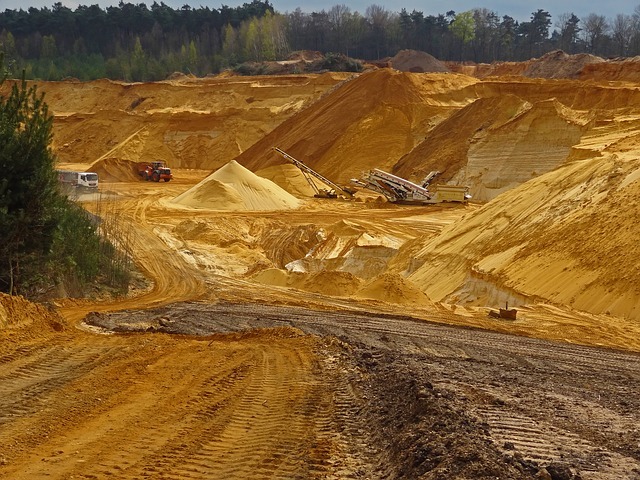 Industrial sand and gravel typically are mined from open pits of naturally occurring quartz-rich sand and sandstone. Mining methods depend primarily on the degree of cementation of the rock. In some deposits, blasting is required to loosen the material prior to processing. The material may undergo primary crushing at the mine site before being transported to the processing plant. The mined rock is transported to the processing site and stockpiled. The material then is crushed. Depending on the degree of cementation, several stages of crushing may be required to achieve the desired size reduction. Gyratory crushers, jaw crushers, roll crushers, and impact mills are used for primary and secondary crushing. After crushing, the size of the material is further reduced to 50 micrometers or smaller by grinding, using smooth rolls, media mills, autogenous mills, hammer mills, or jet mills. The ground material then is classified by wet screening, dry screening, or air classification. At some plants, after initial crushing and screening, a portion of the sand may be diverted to construction sand use. After initial crushing and screening, industrial sand and gravel are washed to remove unwanted dust and debris and are then screened and classified again. The sand (now containing 25 to 30 percent moisture) or gravel then goes to an attrition scrubbing system that removes surface stains from the material by rubbing in an agitated, high-density pulp. The scrubbed sand or gravel is diluted with water to 25 to 30 percent solids and is pumped to a set of cyclones for further desliming. If the deslimed sand or gravel contains mica, feldspar, and iron bearing minerals, it enters a froth flotation process to which sodium silicate and sulfuric acid are added. The mixture then enters a series of spiral classifiers where the impurities are floated in a froth and diverted to waste. The purified sand, which has a moisture content of 15 to 25 percent, is conveyed to drainage bins where the moisture content is reduced to about 6 percent. The material is then dried in rotary or fluidized bed dryers to a moisture content of less than 0.5 percent. The dryers generally are fired with natural gas or oil, although other fuels such as propane or diesel also may be used. After drying, the material is cooled and then undergoes final screening and classification prior to being stored and packaged for shipment. Process Systems & Design are experts in the processing of sand and gravel. Visit http://www.processsystemsdesign.com or call (410) 861-6437 with any inquiries or questions you may have. Belt conveyors are among the most commonly used piece of equipment at mineral processing operations. A conveyor, and the associated transfer points, can generate significant quantities of hazardous debris and respirable dust. Operations must control these emissions by containing, suppressing, or collecting the dust and debris mechanically, either before or after it spills or becomes airborne, giving special attention to transfer points. A conveyor belt consists of many different parts as seen in Figure 1. 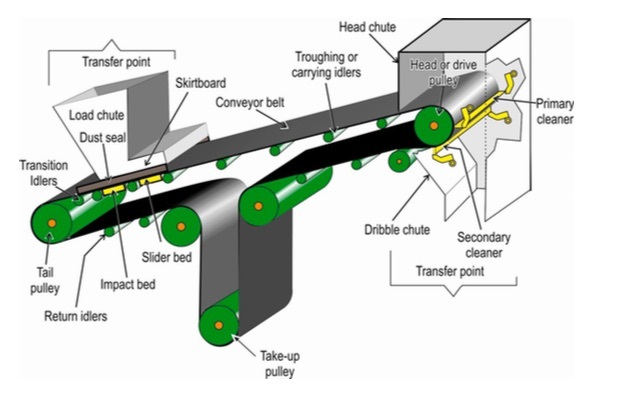 Figure 1 - Basic components of a conveyor belt. There are three primary root causes for hazardous debris or fugitive dust emissions associated with conveyor belts: spillage, carryback, and airborne dust (Figure 2). Control of all three primary dust sources is necessary to eliminate hazardous debris and fugitive dust emissions. Material spillage from a conveyor belt is caused by a lack of material control, either at a transfer point or along the transfer route. Spillage along the transfer route is generally associated with carryback. Material that sticks or clings to a conveyor belt after passing over the head pulley is called carryback. Carryback tends to fall from the belt as it passes over return idlers. This creates piles of material that require clean-up, which can increase worker dust exposure. Also, respirable portions of carryback can become airborne and increase fugitive dust exposure levels. The goal is to remove carryback before it is released into the air and becomes a source of contamination to the workers or creates piles of material that require clean-up. The primary means of controlling carryback is to clean the belt as it passes over or past the head pulley (i.e. shortly after material is discharged from the belt). The two most common means of cleaning a conveyor belt of carryback are to mechanically "scrape" the belt via scrapers or brushes or to wash the belt. Wet spray systems, the use of water to control dust, may be classified into prevention applications and suppression applications. When properly designed and installed, water sprays are a cost-effective method of controlling dust from conveyors. The most common and effective practice for conveyor sprays is to wet the entire width of product on the belt. To discuss this topic in greater detail, contact the experts at Process Systems & Design. They'll be happy to share their decades of experience and knowledge with you. Cement is a finely ground powder which, when mixed with water, forms a hardening paste of calcium silicate hydrates and calcium aluminate hydrates. Cement is used in mortar (to bind together bricks or stones) and concrete (bulk rock-like building material made from cement, aggregate, sand, and water). 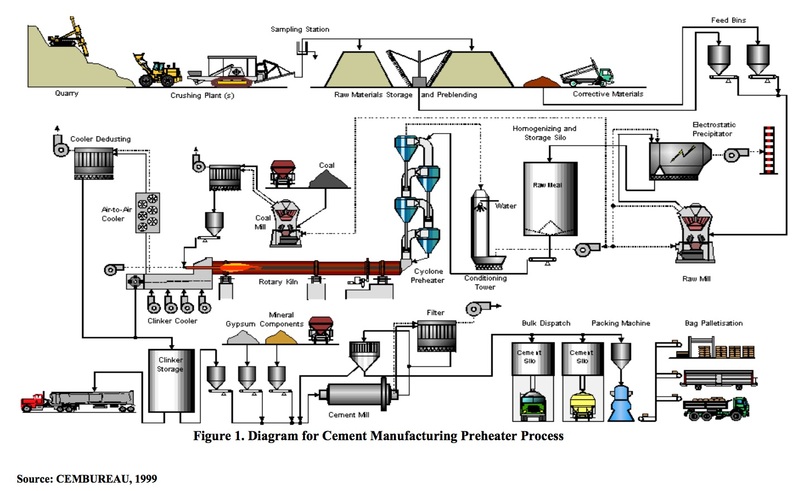 By modifying the raw material mix and the temperatures utilized in manufacturing, compositional variations can be achieved to produce cements with different properties. In the U.S., the different varieties of cement are denoted per the American Society for Testing and Materials (ASTM) Specification C-150. Cement is produced from raw materials such as limestone, chalk, shale, clay, and sand. These raw materials are quarried, crushed, finely ground, and blended to the correct chemical composition. Small quantities of iron ore, alumina, and other minerals may be added to adjust the raw material composition. The fine raw material is fed into a large rotary kiln (cylindrical furnace) which rotates while the contents are heated to extremely high temperatures. The high temperature causes the raw material to react and form a hard nodular material called “clinker”. Clinker is cooled and ground with approximately 5 percent gypsum and other minor additives to produce Portland cement. The heart of clinker production is the rotary kiln where the pyroprocessing stage occurs. The rotary kiln is approximately 20 to 25 feet (ft) in diameter and from 150 ft to well over 300 ft long; the kiln is set at a slight incline and rotates one to three times per minute. The kiln is most often fired at the lower end (sometimes, mid-kiln firing is used and new units incorporate preheating as well as precalcining), and the raw materials are loaded at the upper end and move toward the flame as the kiln rotates. The materials reach temperatures of 2500°F to well above 3000°F in the kiln. Rotary kilns are divided into two groups, dry-process and wet-process, depending on how the raw materials are prepared. In wet-process kilns, raw materials are fed into the kiln as a slurry with a moisture content of 30 to 40 percent. To evaporate the water contained in the feedstock, a wet-process kiln requires additional length (in comparison to a dry kiln). Additionally, to evaporate the water contained in the slurry, a wet kiln consumes nearly 33 percent more kiln energy when compared to a dry kiln. Wet-process kilns tend to be older operations as compared to dry-processes where raw materials are fed into the process as a dry powder. There are three major variations of dry- process kilns in operation in the U.S.: long dry (LD) kilns, preheater (PH) kilns, and preheater/precalciner (PH/PC) kilns. In PH kilns and PH/PC kilns, the early stages of pyroprocessing occur before the materials enter the rotary kiln. PH and PH/PC kilns tend to have higher production capacities and greater fuel efficiency compared to other types of cement kilns. Three important processes occur with the raw material mixture during pyroprocessing. First, all moisture is driven from the materials. Second, the calcium carbonate in limestone dissociates into CO2 and calcium oxide (free lime); this process is called calcination. Third, the lime and other minerals in the raw materials react to form calcium silicates and calcium aluminates, which are the main components of clinker. This third step is known as clinkering or sintering. 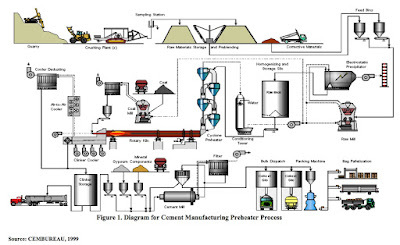 The formation of clinker concludes the pyroprocessing stage. Once the clinker is formed in the rotary kiln, it is cooled rapidly to minimize the formation of a glass phase and ensure the maximum yield of alite (tricalcium silicate) formation, an important component for the hardening properties of cement. The main cooling technologies are either the grate cooler or the tube or planetary cooler. In the grate cooler, the clinker is transported over a reciprocating grate through which air flows perpendicular to the flow of clinker. In the planetary cooler (a series of tubes surrounding the discharge end of the rotary kiln), the clinker is cooled in a counter-current air stream. Reciprocating type grate coolers can also be used to cool the clinker. The cooling air is used as secondary combustion air for the kiln to improve efficiency since the cooling air has been preheated during the process of cooling the clinker. After cooling, the clinker can be stored in the clinker dome, silos, bins, or outside in storage piles. The material handling equipment used to transport clinker from the clinker coolers to storage and then to the finish mill is similar to that used to transport raw materials (e.g. belt conveyors, deep bucket conveyors, and bucket elevators). To produce powdered cement, the nodules of clinker are ground to the consistency of powder. Grinding of clinker, together with additions of approximately 5 percent gypsum to control the setting properties of the cement can be done in ball mills, ball mills in combination with roller presses, roller mills, or roller presses. While vertical roller mills are feasible, they have not found wide acceptance in the U.S. Coarse material is separated in a classifier that is re-circulated and returned to the mill for additional grinding to ensure a uniform surface area of the final product.